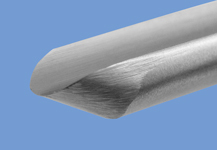 Detail Gouges are made with a shallow flute that leaves more metal under the flute to lessen vibration which leads to a smoother cut. They are used mainly in spindle work for cutting beads and coves or for shaping of weed pots, finger tops or boxes. Sized by the diameter of the steel used, we offer 3/8" and 1/2" that are fitted with a 10" handle.